It has been quite a year for guitar virtuoso Russ Hewitt with his current CD, ‘Cielo Nocturno’, showing all the signs of becoming a run-away success. Shimmering with the rumba flamenco rhythms and lightning guitar runs that have become trademarks of Hewitt’s distinctive style, the album includes a stellar line up of returning musicians including percussionist Raphael Padilla (Miami Sound Machine, Chris Isaak), drummer Walfredo Reyes Jr. (Santana, Steve Winwood, Chicago), bass player Bob Parr (Cher, Barry White), guitarist Alfredo Caceres (Gipsy Kings All-Stars) and most notably Larry Carlton who features on the delightfully easy grooving ‘North of Home’. The radio single featuring Larry Carlton was a mainstay on stations worldwide. The recording was mastered by Chris Bellman who, in his time, has worked with the likes of Van Halen, Stevie Wonder, Michael Jackson and Elton John while completing the lineup are guitarist Ardeshir Farah (Strunz & Farah) on the fiery ‘Persian Sky’ and accordion player Vladimir Kaliazine. 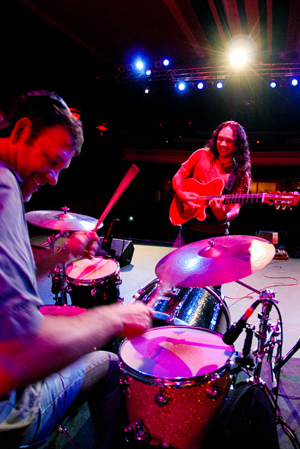 Bellman mastered Hewitt’s two previous releases, ‘Bajo el Sol’ and ‘Alma Vieja’ which not only garnered outstanding reviews from around the world but also drew fulsome praise from his peers. Accolades are coming from all over the world in forms of press and reviews including making the ballot for the 59th Grammy Awards (Best Contemporary Instrumental Album, Engineered Album, Instrumental Composition ‘Persian Sky’); Two silver medal’s from the Global Music Awards in the instrumental category for the song ‘Presido’ and album category for ‘Cielo Nocturno‘; Nominated for ‘Best Acoustic Guitar Album 2016’ from One World Music Awards; Nominated in the Best Jazz Single category from RoundGlass Music Awards (‘Samba Sao Paulo’). The latest CD also made several ‘Best of’ lists including #2 by Vincent Furnier at Soundcheckdfw.com, #4 by Travis Tutwiler at at Soundcheckdfw.com (‘Persian Sky’ featuring Ardeshir Farah was at #6 for his song of the year), #5 by Michael Debbage at MainlyPiano.com, Kathy Parsons at MainlyPiano.com (She did not put number orders to her selections) and honorable mention from Scott Itter at Dr.Music.org. In addition to the ‘Best of lists’ several reviews added their own score rating: 9.5 of 10 by Arthur Gonzales at Rock N Roll Industries; 8.1 of 10 by James McQuiston at NeuFutur; a (perfect) “EQ” (energy quotient) rating of 5.00 by Rotcod Zzaj at Contemporary Fusion Reviews; 4.0 out of 5 by Matt Jensen at Divide and Conquer; Five Starz by Scott Thomas at Guitarz Forever. In fact the favorable opinion gained from Hewitt’s debut CD, ‘Bajo el Sol’, rapidly translated into prolific airplay and a ten-week stay at #1 on Music Choice. It took up residence on the Smooth Jazz indie charts for 16 weeks and the first track to be released to radio (the dazzlingly Latin flavored title cut) climbed rapidly into the Top 20. The follow-up single, ‘Lydia’, enjoyed similar success, peaking at #15 and storming into the Billboard’s Top 40. Not content with that, Hewitt then made it three for three with ‘El Beso’ which also made it onto that same Top 40 listing and was named as one of the top smooth jazz tunes of 2009 by www.smoothjazznow.com. 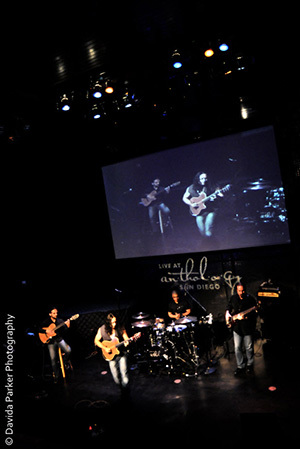 In addition, ‘Bajo el Sol’ was generously acknowledged by the music industry. It was included on the ballot for the 52nd Grammy Awards in the categories Best Pop Instrumental Performance, Best Pop Instrumental Album, Best Instrumental Composition, Best Instrumental Arrangement and Best Engineered Album whilst elsewhere Hewitt gained an ‘Honorable Mention’ for the album’s title cut at the 2009 International Songwriting Competition. 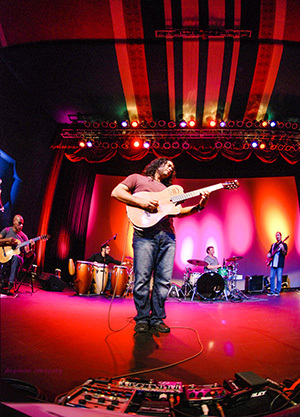 When Russ’s sophomore project, ‘Alma Vieja’ came long in 2011 it delivered two more Top 40 smooth Jazz singles, ‘Pacific Sunrise’ and ‘Samba Samba’. Not surprisingly, Russ has endorsements from a wide spectrum of suppliers and manufacturers. These include Godin guitars, Radial Engineering (Tonebone), Analysis Plus Cables, Morley Pedals, V-Picks, Neunaber Audio Effects, Voodoo Lab, BBF Pedal Boards, Primacoustic, Mission Engineering and DLS Effects. Always striving to extend his boundaries into sound tracks and commercial work, Russ contributes artist interviews and a monthly guitar lessons column to ‘The Sound’ magazine whereas his prowess as a composer has resulted in five Telly Awards (for ‘Parent Compass’) and the DVD companion to the New York Best Seller ‘The Harbinger Decoded’ by Jonathan Cahn. Russ has written the music for the upcoming feature film ‘Thirst: Mission Liberia’ which has already won a Silver Telly in the Spiritual – Faith category and a Bronze Telly in the Documentary category.